InnoDB Integration with Memcached and full text indexes look pretty good. Will wait until you can upgrade automatically before playing with this. 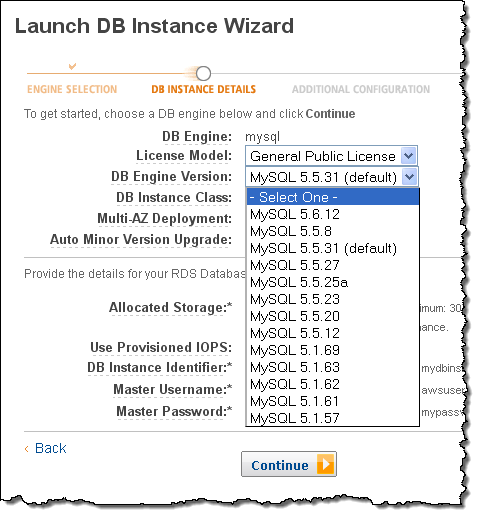 I am happy to announce that the Amazon Relational Database Service (RDS) now supports version 5.6 of MySQL. If you are an existing RDS customer, you know that Amazon RDS for MySQL delivers several important benefits to MySQL customers including ease of deployment, high availability with automatic failure detection and failover, read replicas, push button scalability, automated back-ups, point-in-time restore and automated software upgrades and patching. Crash Safe Read Replicas - MySQL 5.6 improves the reliability of RDS Read Replicas by making the binlog and table data transactionally consistent on the primary database instance. This allows Read Replicas to resume replication automatically after a primary database instance crashes or fails over (in the case of Multi-AZ instances). InnoDB Integration with Memcached - You can use the Memcached API to bypass the SQL layer and treat InnoDB data as a "key-value" store. You can enable Memcached on your Amazon RDS for MySQL instance using a DB Option Group. Binary Log Access - You can download and stream binary logs through the native mysqlbinlog tool. This can be useful for a variety of purposes such as syncing data with an on-premises deployment, audit logging, analytics, and debugging of replication errors. You must enable backup retention for the RDS database instance in order to take advantage of this feature. Online Schema Changes - You can now initiate multiple, concurrent ALTER TABLE operations on InnoDB tables to add columns or indexes while simultaneously running queries. Full Text Indexes - You can build full text indexes (for InnoDB tables) on columns with text based content to speed up searches for words/phrases. Upgrading an existing database instance from MySQL 5.5 to MySQL 5.6 is not currently supported. However, we intend to provide this functionality in the near future. In the meantime, if you would like to port your existing MySQL 5.5 database to MySQL 5.6, you can use mysqldump to export your database from your existing MySQL 5.5 database instance and import it into a new MySQL 5.6 database instance. For more information, visit the MySQL section of the Amazon RDS User Guide.